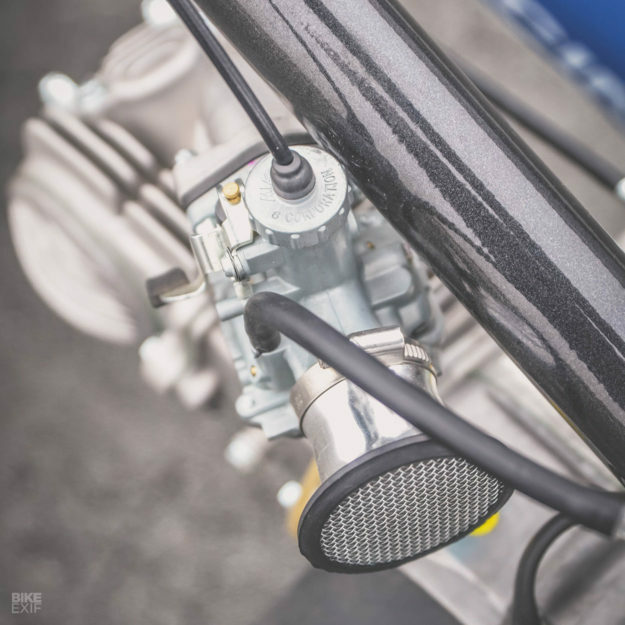 Little bikes are getting big love right now, and nothing sparks admiration quite like the Honda Cub. 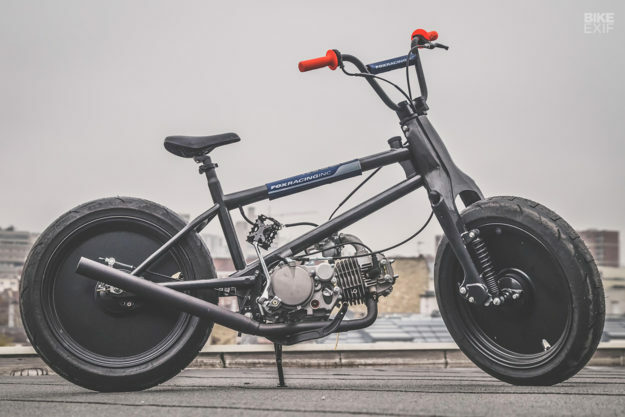 But we’ve just found something even cooler: a hybrid of a Cub and a BMX. If your inner child isn’t bouncing off the walls right now, check your pulse. This cute little slice of whacky engineering is the work of Tom Dun. Operating as 56 Motorcycles out of Paris, Tom’s a half-French, half-Australian custom builder, and he specializes in Cubs and other small capacity Hondas. Given Tom’s love for little Hondas, and his hobbies, building a mash-up like this was inevitable. He’s into everything from surfing to motocross and skateboarding. And skiing and ice hockey. And he’s been riding BMX and dirt bikes since childhood. 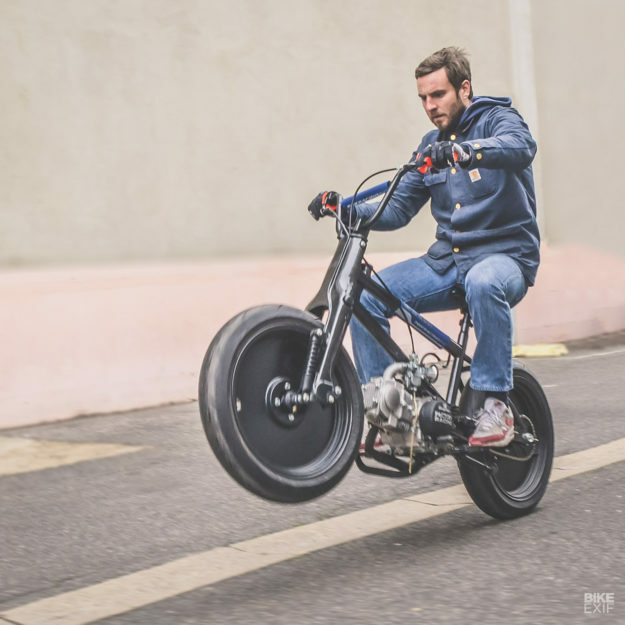 At first glance, it looks like Tom has simply hung a small motor off a big BMX. But there’s a lot more to it than that. 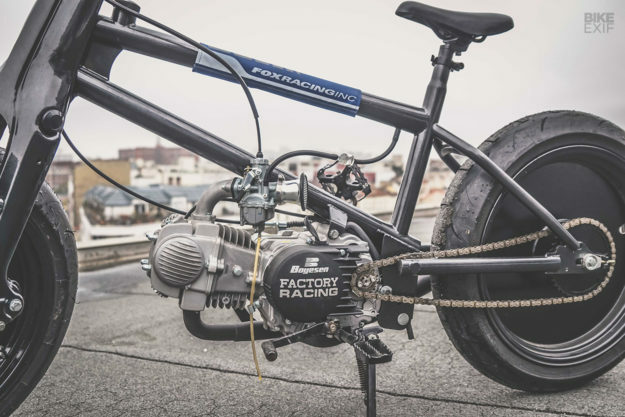 For starters, it’s technically not a BMX frame: it’s a completely bespoke unit, built from multiple parts. 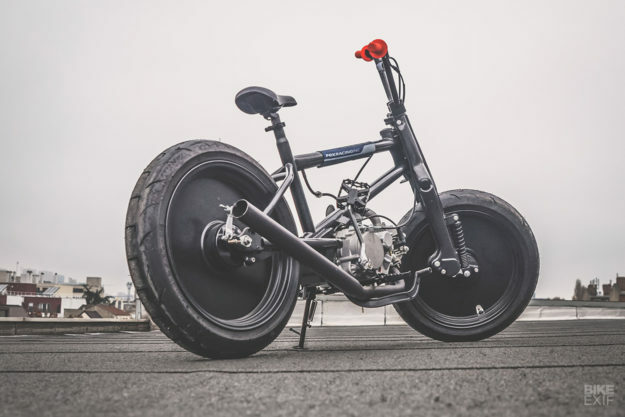 The rear half is distinctly BMX-like, with triangular seat and chain stays, and a traditional bicycle seat tube. 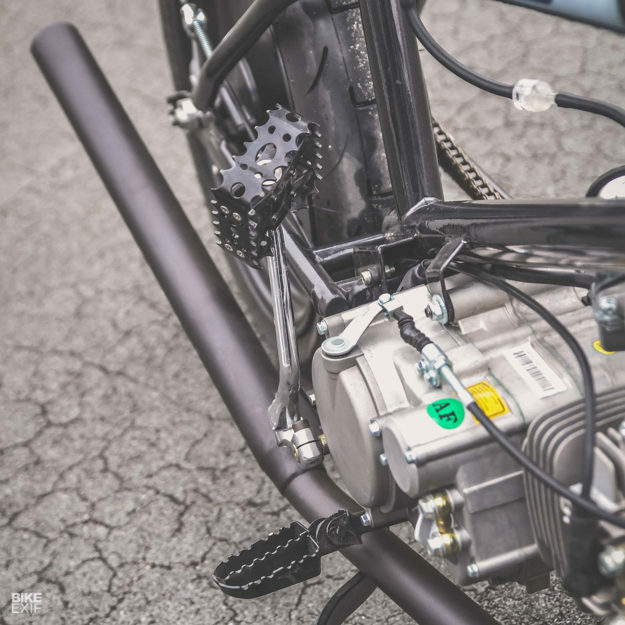 But the front end’s been designed to hold traditional Honda Cub forks, which have been reinforced with extra springs. 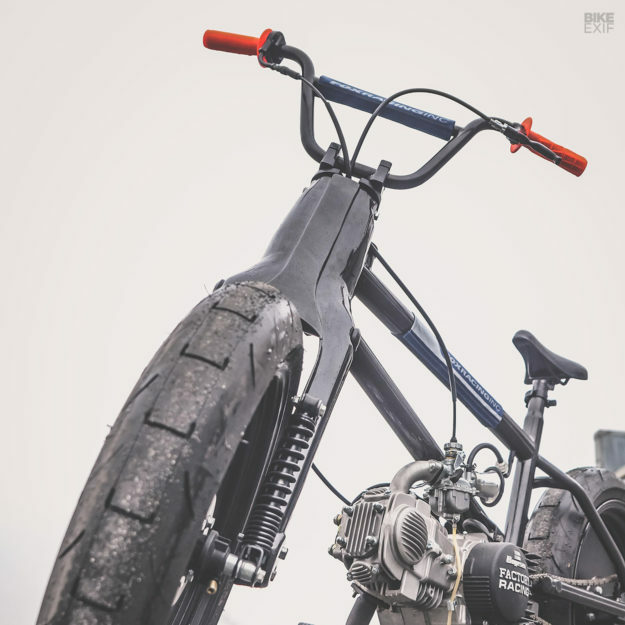 The frame top tube is also the fuel tank, holding a whopping capacity of 1.2 liters (about 40 fluid ounces). Tom added brackets lower down to hold the motor. Even though the idea was to cross-breed a BMX with a Cub, Tom had a better idea in mind for the motor. So this scoot’s packing a YX 150 cc pit bike motor. And it’s been upgraded with a 28 mm Mikuni carb, a custom-made exhaust, and a snappier gear ratio. Tom also added a Boyesen Factory Racing clutch cover—to show that the bike means business. Which it does, when you consider that it makes 15 hp but weighs a mere 66 kg (145 pounds). Sounds like fun, right? 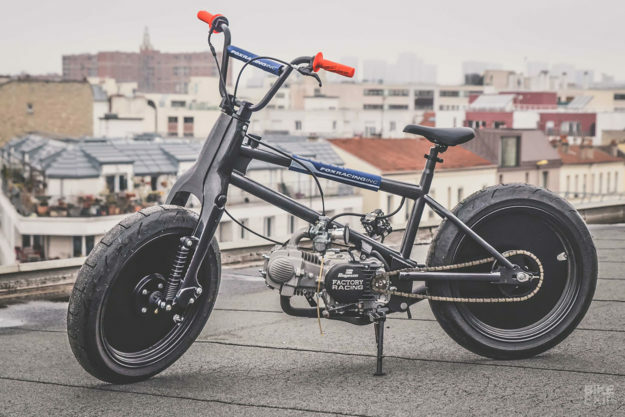 The rest of the bike is delightfully minimal, and playful too. 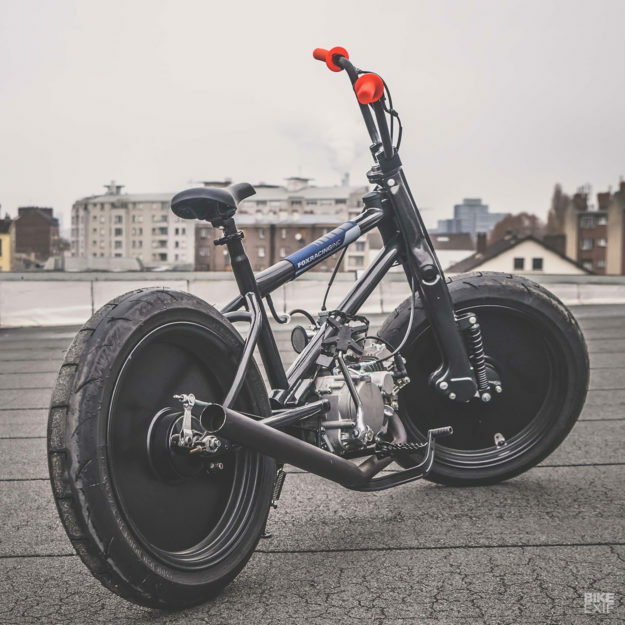 The wheels are 17” solid steel items, shod in Michelin supermoto rubber. Parts like the handlebars, foot pegs and side stand were all borrowed from pit bikes or MX bikes. The kick-start lever’s from a dirt bike, and has been modded with a bicycle pedal. Here’s the good news though: Tom’s already in the process of building more of these. New ideas include better brakes, better shocks, and a version that’s more dirt-focused. Sign us up!